The Freedom Fund welcomes the award of the 2018 Nobel Peace Prize to Nadia Murad, a Yazidi woman who has become a powerful international campaigner for the accountability of those who sexually enslaved Yazidi women and committed other atrocity crimes against the Yazidi people. The other highly worthy joint winner this year is Denis Mukwege, a doctor who has spent large parts of his adult life helping the victims of sexual violence in the Democratic Republic of Congo. 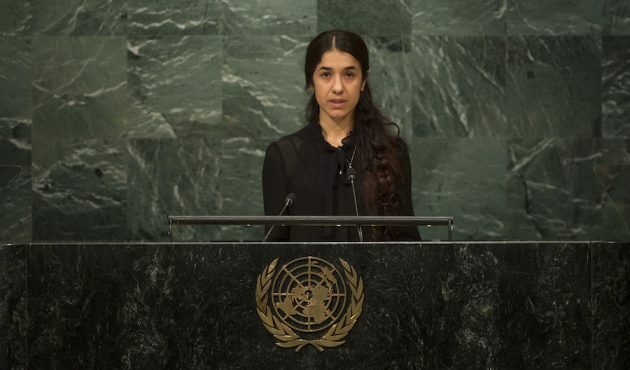 Nadia Murad was subject to the most horrific violence at the hands of ISIS in Iraq in 2014, along with her family, her community and thousands of other Yazidis. The Freedom Fund documented these abuses and called for international action in our 2015 report with the UN University on the Role of International Justice in Fighting Modern Slavery. I first met Nadia when she was relatively unknown on the international stage when we both gave testimony to the UN Security Council in December 2015 in its first-ever formal debate on modern slavery and human trafficking. Her testimony was searing and utterly heartbreaking. You can read that testimony here. Nadia’s receipt of the Nobel Peace Prize will be a powerful recognition not only of her courage in the face of unimaginable suffering but hopefully will also shine a spotlight on the ongoing plight of Yazidis driven from their lands (read “Only the bones remain” by BBC’s Lyse Doucet for a recent account of their plight), and of the horrendous crime of sexual slavery in conflict. Pictured: Nadia Murad addresses the opening segment of the United Nations high-level summit on large movements of refugees and migrants on 19 September 2016.